Filing is achieved by simply dragging and dropping the files onto the correct filing cabinet/folder. All your scanned, PDF and MS Office documents can be easily filed. An easy to use indexing structure can be created to suit your organisation. This structure defines the types of information you can associate with a document. Virtual Cabinet scanning can be performed from high-speed production scanners or alternatively seamlessly linked in with your existing multifunctional device. 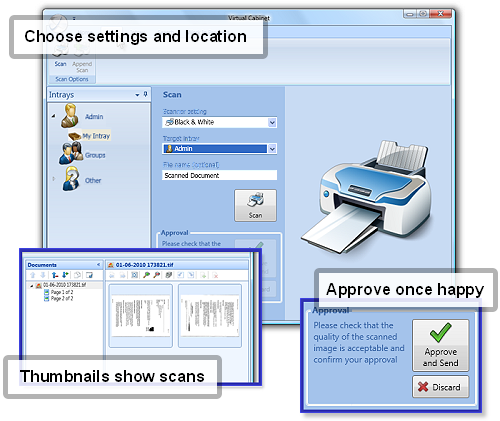 Simple tools allow information to be hidden if you want to protect areas of the document. 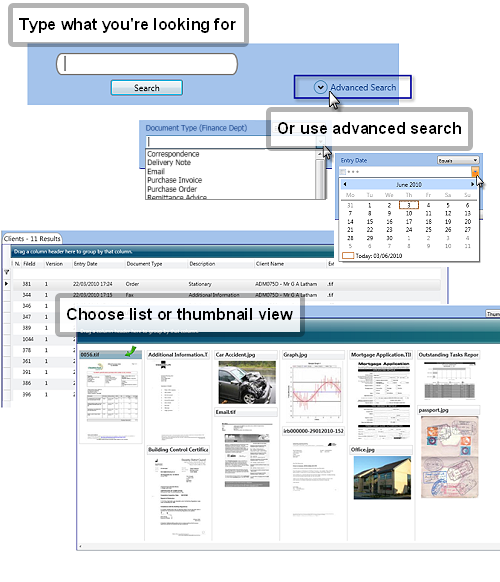 You can search for documentation in many different ways. You can simply search for a client file or combine the client file search with some further refining criteria e.g. Period End, but any of your document references are searchable. These search results can also be displayed in thumbnail form ensuring easy identification of the document required: Even the content of the document is searchable. Once selected, multiple documents can be viewed in our multi-format viewer so you can review a spreadsheet, word document and scanned image all one after another. 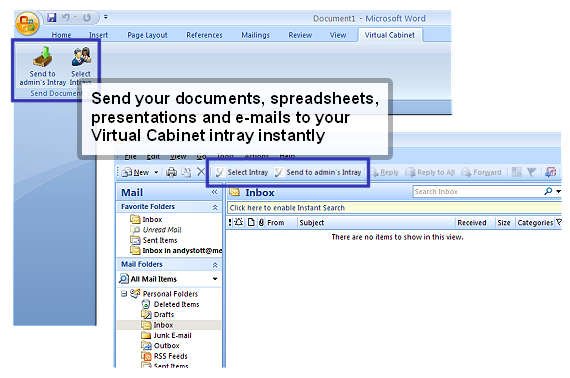 E-mails, Word docs and Excel spreadsheets can be automatically filed into Virtual Cabinet. Just click the button, choose a location and you're done - it really couldn't be easier. Find any paper or electronic document instantly. Save time, save space and save money!